Team 'Arrow' Loses Yet Another Member in "Brothers in Arms"
The very foundations of Team Arrow aren’t just shaken, they’re demolished. Team Arrow lost yet another member after Thea left Star City for good last week. This Season has long been about shaking up the status quo for Arrow, and in this episode, they do it by destroying the friendship that started this whole venture back in Season 1. Diggle has officially left the team. This is kind of the last straw after Team Arrow split up in the mid-season premiere. Things are worse than ever in the war against Diaz, and the stress pulls the team apart completely. It’s just Oliver and Felicity now. 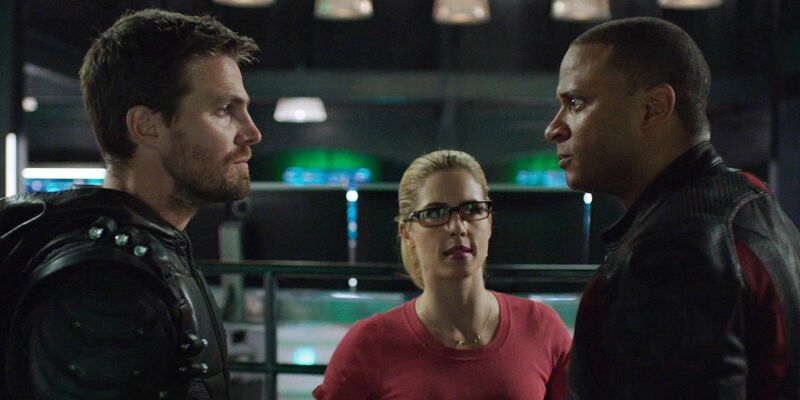 “The way you lead alienates everything and everyone around you!” Diggle says, calling Oliver out. He basically says that Star City deserves a better city because of how selfish Oliver’s being. This is only the beginning in an explosive scene in which they both call each other out for all the bad decisions they’ve made, dredging up things that happened seasons ago in some cases. Yeah, it eventually comes to blows. Why are they wearing the exact same thing in this scene? In a way, Oliver’s greatest enemy has always been feelings, and in this episode he proves yet again how little he’s learned in the way of emotional sensitivity. Now that he’s almost totally alone, he’ll have to do some self-reflection to figure out how he’s going to get through this latest rough patch. On the plus side, Oliver and Diggle do reconcile somewhat, putting aside their differences for one last important mission to take down one of Diaz’s huge Vertigo-production facilities. Diggle’s lost faith in Oliver’s leadership, both as the mayor and as the Green Arrow because he splits his time between the two. They walk away from this still having a begrudging respect for one another, but the rift might be too great to ever truly reconcile. Arrow airs Thursday nights at 9 p.m. Eastern on The CW.